As most of you know Grissini is the Italian word for breadsticks. 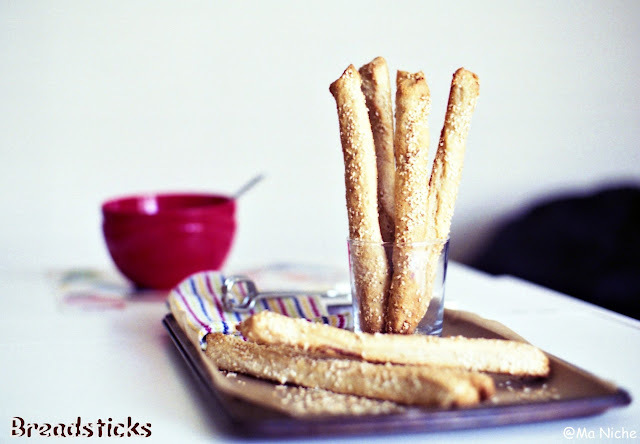 though breadsticks are often served as appetizers in USA, in the restaurants in India, it is usually served with soups. so when Ninive from Ninivepices chose Bread for company / Brot als Begleitung as the theme for Zorra's monthly Bread Baking Day event, the first bread that crossed my mind was breadsticks aka Grissini..
Beth Hensperger's Grissini recipe from The Bread Lover's Bread Machine Cookbook. i prepared the dough in the bread machine. for this i simply put all the ingredients in the bread machine pan and programmed it for the dough cycle. when the cycle ended i turned the dough out into my 13.25 x 9.25 x .625 inch baking tray and patted it to fit the tray surface. then brushing the surface with olive oil and covering with a plastic wrap i put the tray in the refrigerator and let it slow rise for the next 3 hours. when ready to bake, i took the dough out of the fridge. let is rest on the kitchen counter for half and hour or so until its temperature was the same as the room temperature. i then placed the a baking tray on the center rack and preheated the oven to 425 degrees F.
now placing the additional olive oil, dried rosemary and sesame/semolina in separate shallow bowls i set about shaping the dough for the breadsticks. to shape the dough, i started by first pressing it gently to deflate it. then with a pizza cutter I cut the dough into 4 equal parts and then cut out from each quarter 6 long strips. then picking each strip and working from the center, I stretched them about 8-9 inches long. i dipped them in olive oil, sprinkled some rosemary on them and rolled the strips over the sesame/semolina. once all that was done i placed the strips on a long enough parchment paper and transferred the sheet to the baking tray that was there inside the oven and baked for 20-25 minutes until they were lightly brown and crisp. while these breadsticks taste good with a dip in pesto, we really really liked them with our Broccoli Lentil soup (a recipe that I have shared in The F list this week). note : the recipe recommended the use of baking stone instead of baking tray. so in case to have a baking stone you'll probably need to bake these for only 15-20 minutes. I was a little unmindful and totally overlooked the use of baking stone so i baked my batches as mentioned above. I am also yeastspotting them. I may need to give this a try! Thanks so much for linking up to Friday Food Frenzy! Thanks for dropping by Danielle . And thank you a lot! Thanks for dropping by. I really couldn't reach you so mailed through Zorra.